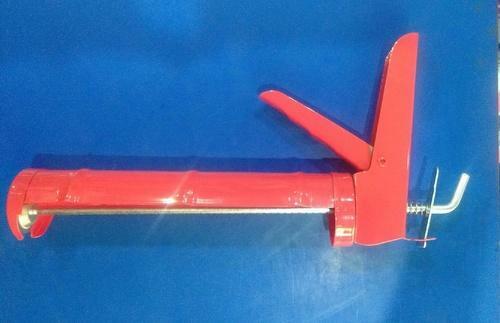 With assistance of technically assisted facilities at our ultra-modern manufacturing unit, we are offering Caulking Gun. Our offered product is acclaimed in the market for its superior quality & finishing. This product is manufactured by quality basic components & best techniques in fulfillment with industry standards. Our clientele can purchase this product in a bulk quantity within stipulated time-frames. We, Global Powertech Engineers, established in the year 2007, are a renowned organization engrossed in manufacturing and supplying a broad gamut of Mechanical and Electrical Tools to our clients. Offered tools in this range include Hex Key Singles, Combination Pliers and Adjustable Wrench. Manufactured by employing quality approved basic material, these tools find their application in a number of industries such as automobile, construction and cutting tool. Further, our offered range of tools has been appreciated by the clients due to its perfect finish, high shine, robust and sturdy construction, durable standards, dimensional accuracy, resistance against corrosion and abrasion. Moreover, we are offering these tools at pocket friendly prices. In addition to this, for the purpose of manufacturing these industrial tools and suit the requirements of the clients timely, we have an ultra modern infrastructure unit, which helped us to serve our clients in the most effective manner. All offered products are stored under several categories in order to retrieve them without any inconvenience and hence ensure faster delivery. Moreover, our warehousing division is connected with wide distribution network for the purpose of delivering the offered products within requested time frame to the customers' end. Also, we have with us, a modern packaging unit for the purpose of packing these products by taking high-grade quality packaging material. In addition to this, we ensure to test the quality of the whole range before delivering products to the clients in order to ensure their accordance with globally accepted quality standards and stand by the expectations of our customers.